The soldiers of Alpha Company 1/121 Battalion made a furry friend named Bear during their first month of deployment in Afghanistan. The scruffy stray wandered up to them and quickly stole their hearts. Now, with seven months left before they head home to Georgia, the soldiers are working to ensure Bear joins them in the U.S. They have partnered with the non-profit organization, Nowzad to raise funds for Bear’s safe passage. Like many other “war dogs” before him, Bear will need to be vaccinated and undergo quarantine before arriving in the U.S. It is a long, expensive process, but to Bear’s friends, he is definitely worth it! “Being over there with Bear gives them something to be happy about,” said Alyssa Bailey, whose boyfriend, Chris is a member of Alpha Company 1/121 Battalion. Unfortunately, Bear is not allowed on base so the soldiers take turns bringing him food. “He’s super sweet and he’ll just lay around and hang out. They just love him, they’ve bonded with him,” Bailey said. The gentle pooch has become something of a therapy dog to the Battalion. In addition to their love for him, they fear what may happen to the stray if they are forced to leave him behind. “Bear has no one out there to take care of him if they can’t take him home,” Bailey said. He will have the opposite problem if/when he arrives stateside – according to Bailey, several of the soldiers want to give Bear a forever home! 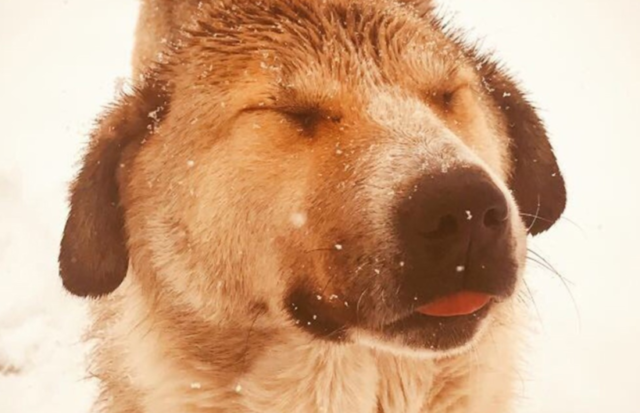 A fundraiser created by Nowzad for Bear and another pup named Shank has raised $11,000 of a $15,000 goal to cover the dogs’ veterinary care, quarantine, and passage to America. Click here to help bring Bear home to the USA!